I took this shot during my trip to the Rockies back in August (2014). One of my clients out there had just had me over at his house for dinner with him and his wife. Earlier in the day we hiked all the way up to the top of Hallett Peak which is still the highest elevation I’ve ever been outside of an airplane at 13,000+ feet above sea level. The Ute Trail in Rocky Mountain National Park is unique because the majority of it sits above the treeline (11,000 feet in the Rockies) which allows expansive views along the entire route. 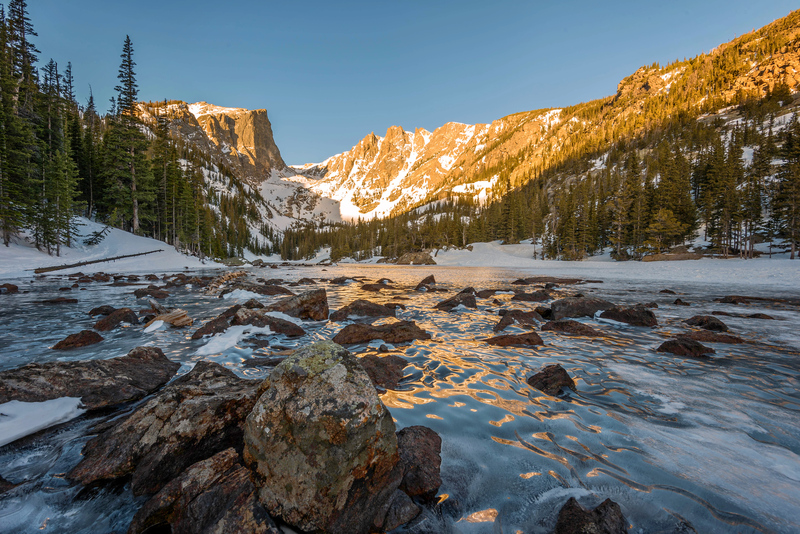 A quickly rising trail from the Bear Lake Trail head in Rocky Mountain National Park takes you the 3.25 miles to the shore of Lake Helene at the base of Notchtop Mountain. I was hiking in the dark so that I could catch sunrise at the lake and though I had been there the day before I missed the turn initially and hiked right past it. Fortunately, I knew the general vicinity where I was looking and realized pretty quickly I’d hiked right by it. After backtracking a bit the sky was starting to light up and there was only around 15 minutes before the sun was set to start lighting up the peaks of the mountain. I heard some rustling through the trees and thought for sure it was going to be a bear or an angry moose (while hiking the day prior I saw a moose on the trail and was told she frequented the lake) but was happy to see a flash of light as the being turned to face me. I started in the direction of the light (another hikers headlamp) as I knew that he too was photographing sunrise at the lakefront. Typically, I’m not happy seeing other hikers/photographers when I’m this far out but given the circumstances I was pleased to just be able to follow his light to my destination.